NAIROBI, June 18 (Xinhua) -- Relations between China and Africa have advanced significantly, in particular in recent years, in various fields, with bilateral cooperation expanding to broader frontiers, which are witnessed, campaigned and backed by their leaders and peoples. A grand dragon boat racing, a traditional folk activity normally held during China's Dragon Boat Festival which falls on Monday, kicked off in Uganda on Saturday, co-hosted by friendship associations of both countries. This was the second time that the event carrying the the culture of the Chinese Dragon Boat Festival appeared in Uganda since it made debut in the country in May 2017. China's top political advisor Wang Yang, who concluded his four-day visit to Uganda on Saturday, and Ugandan Vice President Edward Kiwanuka Ssekandi attended the opening ceremony of the event in Uganda's southern city of Entebbe. Wang, chairman of the National Committee of the Chinese People's Political Consultative Conference, told the opening ceremony that the dragon boat racing in Uganda will again write a vivid story about the friendly exchanges between the two peoples. Wang said that China and Uganda have actively held a diversity of cultural exchange activities in recent years, constantly consolidating the foundation of public will over the China-Uganda ties. Ssekandi said that Uganda is the first African country that holds dragon boat racing during celebration of the Dragon Boat Festival. The competition, integrating the two countries' traditional culture elements, is highly welcomed by the Ugandan people, and is a symbol of the two people's unity, he said, adding the event could promote the two countries' cultural exchanges to a new level. As the friendly relations between China and Uganda are consolidated and deepened, the two countries will have more cooperation in fields of people-to-people exchanges, sports and tourism, he said. Ayoub Tewele, a third-year student at University of Dar es Salaam in Tanzania, is among a growing number of young Tanzanians and Africans who turn to learning Kung Fu (Chinese martial arts) and Mandarin with gusto amid blossoming ties between Africa and China. Tewele started his lessons in Kung Fu and Chinese language six months ago, driven by a desire to keep physically fit, improve his understanding of China's rich culture, and realize his dream to visit China. Tewele told Xinhua that practicing Kung Fu and Mandarin has been physically and intellectually rewarding. Tewele went to last year's global Chinese Language Bridge Competition held in Shanghai after winning second place in his country's national Chinese language proficiency contest. Also, Tewele and his peers love the China Culture Center established in 2015 at the University of Dar es Salaam, saying the center has fostered cultural exchanges between Chinese nationals and locals. Over the past two and a half years, the center hosted more than 100 events to promote interactions between locals and Chinese nationals, including the latest events earlier this month, ranging from martial arts, Mandarin classes to demonstrations on preparing Chinese tea. During the latest events, Huang Meishan, a Chinese teacher, and her colleague He Lei demonstrated to Tanzanian students how to prepare Chinese Kung Fu tea. Suleiman Abdallah and his colleague Saidi Saleh were among the students. They appreciated Kung Fu tea's aroma, taste and medicinal properties. The two young Tanzanians recently toured China for two weeks, where they learned about China's abundant culture and economic miracle. In Kenya, the Chinese language and culture are also popular with young Kenyans. Mwika Kiarie, an anthropology major who is studying Chinese language at the University of Nairobi's Confucius Institute, said he wanted to become "a bridge" for bustling China-Kenya exchanges in the near future. "I look forward to becoming a bridge between Chinese and Kenyan business people though performing tasks like translation, logistics and even humanitarian affairs," Kiarie told Xinhua. Xiao Shan, Chinese director of the Confucius Institute at the University of Nairobi, said young Kenyans' enthusiasm for mastering the Chinese language and culture is unmatched in the region. She said that the Chinese language has become an effective means of fostering a healthy friendship between Kenyans and Chinese nationals living in the country. 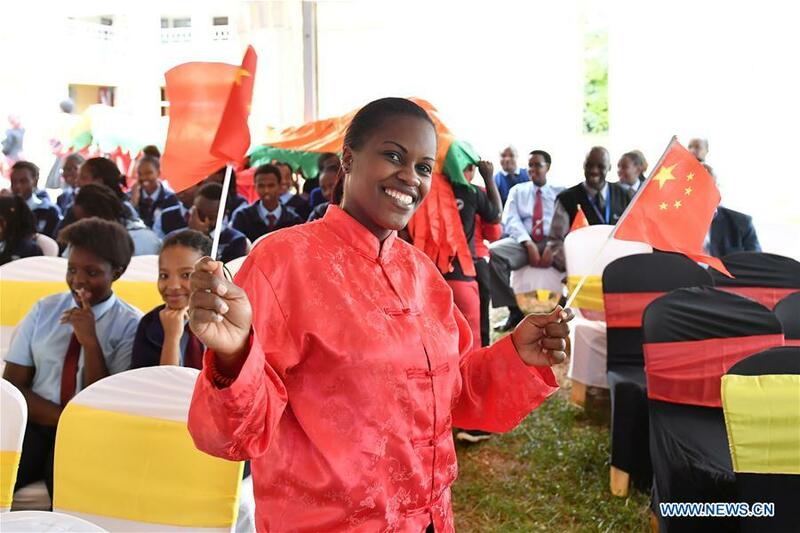 The Confucius Institute at one of Kenya's oldest universities has enrolled over 5,000 students, with its activities reaching about 10,000 locals, and it is planning to introduce Chinese language classes on satellite campuses, she added. Franklin Asira, chairman of the Sino-African Cultural Exchange Association that was launched in Nairobi in late March, said that people-to-people interactions have become the defining feature of China-Africa cooperation. In Uganda, the China-Africa Friendship Association was launched in the capital Kampala five years ago, as China has left a strong footprint in Uganda through trade and infrastructure development and bilateral cultural exchanges have become more frequent. Chinese firms like StarTimes have rallied behind this cross-cultural exchange by supporting the production of a Kung Fu movie for local audiences in Uganda. Simon Ivan Kakembo, an employee of Hisense Uganda, said that his Chinese colleagues have fallen in love with local culture and often attend weddings of their Ugandan co-workers and friends. Early this year, Uganda's oldest and most prestigious Makerere University announced that it would start offering a bachelor's degree in Chinese and Asian studies. China-Africa friendship and exchanges have moved beyond traditional areas like trade, infrastructure development and skills transfer to sports, tourism, medicine, technical management and scientific research. African countries like Kenya has intensified its efforts to attract Chinese tourists through digital marketing and recruitment of staff who are fluent in Mandarin at major attractions, like wildlife sanctuaries. Kenyan Cabinet Secretary for Tourism and Wildlife Najib Balala told Xinhua that the government is targeting 100,000 Chinese tourists in the next one or two years, up from 69,000 people who visited the country in 2017. Chinese and Kenyan athletes have been on the frontline to promote friendship through joint training. Zhang Xinyan, a Chinese female middle-distance runner from Gansu province, and her five colleagues from Yunnan province in late April joined their Kenyan counterparts for a month-long training at the "home of champions" located in Eldoret town. Chinese artists hosted an exhibition in Nairobi University in April to present their charming paintings and drawings. Kiprop Lagat, director of culture in Kenya's ministry of sports, culture and the arts, said all genres of art, including music, dance, painting and carvings, have cemented bonds of friendship between the Chinese and African peoples. Chinese doctors surely have set a precedent in promoting friendship with African people through the provision of free medical services in the continent's remote areas that were heavily affected by infectious diseases. The latest development could be seen at the China-Congo Friendship Hospital located in the mineral-rich Republic of Congo, where local people suffering from cataracts regained their eyesight after successful operations by Chinese surgeons. "I want to express my thanks to the Chinese doctors and they are truly professional," said 65-year-old Balossa Yvonne, whose eyesight recovered after the surgery. Zhang Weipeng, an optician at the China-funded hospital, said it is aiming to offer a new lease on life to local cataract patients. The Sino-African Joint Research Center, based at Jomo Kenyatta (SAJOREC) University of Agriculture and Technology outside the Kenyan capital of Nairobi, shows thriving ties between China and its African partners. The Chinese Academy of Sciences has equipped SAJOREC to enhance its capacity to implement joint research projects. Since its establishment in 2013, the center has launched 45 joint research programs focusing on biodiversity, pathogenic microorganism detection, remote sensing, crop cultivation, and land and water resource management. It also has helped train about 160 scientists and senior technicians from 13 African countries. In Kenya, the operation of the the Nairobi-Mombasa Standard Gauge Railway (SGR) commuter service, which was launched on May 31 last year along the 480 km China-funded modern railway linking Nairobi to the port city of Mombasa, is also continuing to boost the friendly cooperation and exchanges between China and Kenya. Felix Asuma, a 27-year-old workshop supervisor at the SGR, felt honored to be among young Kenyans whose expertise has been harnessed to operate the SGR train service since its launch. "My experience since I joined the SGR commuter service last year has been good. It is built on advanced Chinese technology that I am familiar with and having been mentored by Chinese engineers, I am convinced I have gained enough skills to handle its operation and maintenance," Asuma told Xinhua on Friday. Harrison Kimani, who joined the SGR in February 2017 as an assistant manager in charge of passenger service, said that working alongside his Chinese colleagues has been professionally rewarding. Kennedy Chemeitoi, a general affairs clerk at the SGR, said he has learned a lot since he joined the company. "My Chinese mentor has taught me a lot," he said. "The Chinese are very responsible. They want to make sure you have mastered the expertise."